I’m trying to find a single ‘desert island’ synth that can decently cover as wide a range of sound types as is possible in a single synth. Probably analog, though maybe some kind of hybrid. In any case I really just want one synth that I can really focus on and get to grips with so... what’s the most versatile iOS synth out there? Would’ve been z3ta+, but no sooner did Cakewalk FINALLY update z3ta+ did stupid Gibson shut Cakewalk down and then shuttered their own doors a couple months later. Thor would be my secondary “desert island” choice. I get where you are coming from. Lately I've had thoughts I should delete half the stuff on my iPad just toward that end - learn a couple of apps well and actually record/finish ideas. The whole range of choices app collecting offers seems to be becoming more distracting than productive, as I'll spend an hour trying all the chorus fx apps.... just makes me think of when getting a new fx or synth was a piece of hardware, costing plenty - that was going to be my one reverb, or synth, or workstation. There was no doubt about learning the thing inside out. And when recording/gigging I would know how to get what I wanted with what I had. Certainly can't say that's where I'm now with all these choices I have on this little glass tablet. But in terms of your question - though you mention "probably analog and maybe hybrid", you may need to add some adjectives there for relevant opinions... edgy analog, evolving,, whether you lean towards basses or pads, etc.... or perhaps suggest a range of genres sound wise that might clarify what you would picture yourself recording on this island (which I'd presume has a fantastic renewable power source, and a kicking PA run your iPad through). Great new photo Doug. Was that taken when you were told the price of a new iPad Pro? I'm not crazy about the sound of LayR, and I don't think it is the most flexible of available synths. If you want maximum coverage and flexibility, then Sunvox or Dhalang are the obvious choices. Zeeon was the one that finally made me stop caring about getting every new synth that came out. I’m gonna go with that. 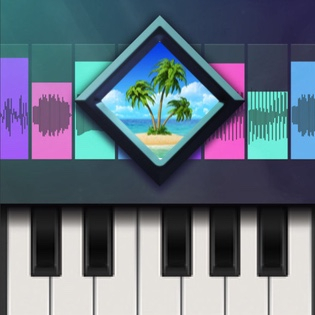 I’m guessing Synthmaster One will become that desert island synth once released. Shiny is my favorite color. Our blessing and our curse, lol. Alchemy by a country mile. Can do very digital to very analog sounding. One of the best bass sound machines for variety ever! Covers all other types of sounds from wind to strings to synth leads. Each of its wavetables ‘OSCs’ can be it’s own sound, so layered sounds are covered. The save system gives the ability to email banks of your own sounds for that all important backup, with no external computer needed. One of the best systems (once learned) for creating presets. It’s sort of semi random and really gives you the ability to get presets of any type going quickly. While an out and out digital synth, it does have a great sounding filter. Like the PPG hardware synths, this sound synthesis is as adept at making synthetic sounds as it is at emulation of some real would sounds (for a non sampling instrument). Bells, flutes, bass, organs, stringedetc etc it’s all their once you know how - and that’s it’s only down side for some - the learning curve for some may be a little more than your average synth. I’m not saying it’s difficult to learn - it is not. WaveMapper comes at things from a different mindset and hence for some my seem alien initially. Once you put in the effort though, it uses surprisingly simple methods for all things really and soon what once seemed complex, becomes so easy to use. Did I say it has the best basses? Yeah I probably did lol. Why? Because bass sounds are more complex to emulate than many think - Wave table synths have the ability to put a sense of movement into sounds and with three wavetable ‘OSCs’ in WaveMapper, making the individual sounds that make up a stringed sound easy to gel together. WaveMapper has little in the way of fx. Yeah it can put a little delay in the mix, but just add external fx of choice to make your sounds shine. The website also includes many banks of sounds (it will play WaveGenerator banks too). Zeeon covers a huge territory and it just keeps growing on me. Adding Synthmaster ONE I believe these two will make a great and flexible tandem and my go-to-synths for the foreseeable future. I might keep some apps modelling vintage classics like the iMini by Arturia just for fun but I am VERY close to deleting many synth apps just to focus on a chosen few. They restrict my creativity! There are TOO many choices and as others have said, I get stuck just trying things out. 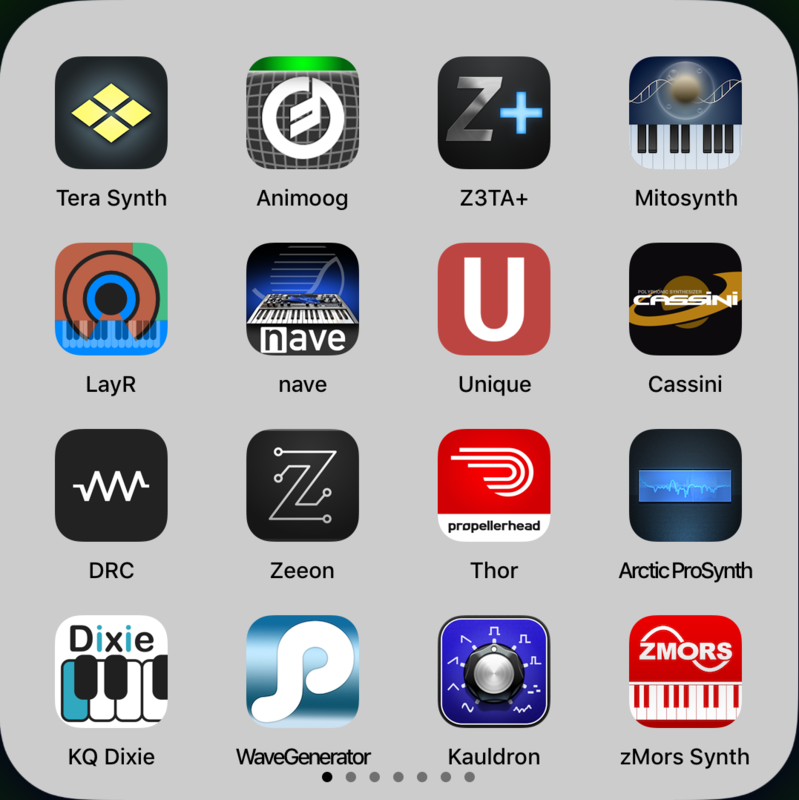 I do not believe in the "one-to-rule-them-all"-theory but I do believe a well thought-out app collection of lets says five synth apps tops will be enough to keep me busy for a long long time. Until the next app surfaces and I have to...... no, not going there now:-). I so much want to buy hardware with myriads of tweaking buttons but when I see the huge sonic possibilities already inside my iPad, and considering the costs and the space they would take I just can´t condone this. I am amateur playing around and as much as I love to get new gear and apps I am just scratching the surface of what I already got. iWavestation for me since we're talking synths and not combined apps. The first ios synth that I got is still one of my favourite go-to synths - AniMoog. In fact is it what pushed me into getting an iPad in the first place. If I could only have one synth, it would be Zeeon. That said, I’m really loving KQ Dixie, and iM1 and iWavestation are both classics, obviously. Nice selection! How do you feel about Infinite? I always come back to it.